The Apex Legends tier list is finally here! We've been eagerly anticipating the launch of the Apex Legends battle pass for some time and now that it's arrived, we can feast our eyes on what rewards are contained within the tier list. Apex Legends has been out for almost two months and with the tier list now in the game, players have something to level up and work towards. Here's everything contained in the first season of the Wild Frontier Apex Legends tier list and battle pass. Just for buying the battle pass you'll gain access to three skins; Lifeline, Mirage & Wraith, then the first few tiers have Triple Take & Hemlok skins, along with an intro quip for Bangalore. The next section of tiers rewards players with 200 Apex Coins, a Prowler & Longbow skin, along with an XP booster. Tier 16 has a Mirage intro quip, followed by another 200 Apex Coins and a Spitfire skin at 19. Reaching 24 grants a skin for everyone's favourite gun, the Mozambique, while there's an epic Apex Crate at 26 which guarantees players at least one Epic reward. There's also a Pathfinder voice line at 27. The game's best sniper - the Kraber - gets a new skin at 29, followed by an Eva-8 Auto skin at 34 and a Caustic voice line at 36. There's another 100 Apex Coins and an XP booster up for grabs too. There's another 200 Apex Coins here, along with a Flatline skin at 39, a standard Apex Crate at 43, and an Alternator skin at 44. Oh, and another XP booster! The first skin for the new Legend, Octane, is at tier 48, along with a Gibraltar voice line at 46 and a Peacekeeper skin at 49. Right after that is a legendary Prowler skin at 51, another apex crate at 53, a Devotion skin at 54 and a Wraith voice line at 56. Two more weapon skins here with the Mastiff at 59 and the P2020 at 64, along with 200 more Apex Coins and the first banner frame at 61. Here's a Bloodhound intro quip at 66, a Havoc skin at 69 and another banner frame at 71, along with 100 more Apex Coins at 67 and another XP booster at 72. You can get your hands on another normal Apex Crate at 73 followed by an R-99 skin at 74. There's also an Octane intro quip at 76, 100 Apex Coins at 77, and a Wingman skin at 79. 81 has another banner, along with an XP booster at 82, Apex Crate at 83, and Re-45 skin at 84. 86 is a big one though; a legendary Apex Crate which guarantees at least one random legendary item. The few tiers before you hit the end of the battle pass are somewhat underwhelming, with another 100 Apex Coins, two XP boosters, two banner frames, a standard Apex Crate and a G7 Scout skin. 96 offers a Lifeline voice line, 98 has another banner frame, and 99 has an R-301 skin. Tier 100, the ultimate end to the Apex Legends battle pass, has a Havoc skin. But not just any Havoc skin. This tier 100 reward is the first weapon skin in Apex Legends to be reactive; the more kills you get with the Havoc throughout the game, the skin will evolve through three stages. The eyes start to glow and the nostrils will emit smoke. Pretty cool, right? 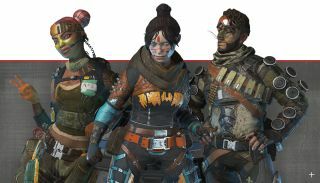 The Apex Legends tier list and battle pass will be available from 5pm GMT on Tuesday, March 19 for 950 Apex Coins.